For close to a year, Ruth Kantor watched helplessly as pancreatic cancer destroyed her father, a Russian immigrant who once drove a milk truck to put himself through pharmacy school. Except for some arthritis, Victor Kantor was still remarkably healthy at 75. But he began feeling chronically ill a few months after his first grandchild was born. His 1971 death has lingered for all these years in the mind of his daughter, Ruth, as have the deaths of an uncle and grandmother who also succumbed to pancreatic cancer. The disease is the nation’s fourth leading cancer killer, claiming within five years the lives of 92 percent of those diagnosed. Now, Ruth Kantor is doing her part to ensure that fewer families will have to grapple with this deadly disease in the future. She has pledged a minimum $3 million gift from her estate to the Department of Pathology at Johns Hopkins to fund research aimed at improving early detection and treatment of pancreatic cancer. Though Kantor had relatives who attended Johns Hopkins, it was the Department of Pathology’s research reputation that led her to establish the Victor Kantor Family Pancreatic Cancer Research Fund. Kantor said she has long admired the Johns Hopkins medical staff’s reputation as solvers of complex medical mysteries, and she liked the facilities in Baltimore for their brightness and hope. Her confidence in the Department of Pathology’s innovative research approach was buoyed by the emphasis placed on understanding the role genetics plays in pancreatic cancer and the focus on early detection methods. Kantor was inspired by faculty members Laura Wood, MD, PhD, whose team is using DNA sequencing to identify the genetic drivers of this deadly disease, and Michael Goggins, MD, who, along with his research team, has developed more effective methods of early detection of pancreatic cancer. Kantor, now 75, is healthy, but knows her own risk of developing pancreatic cancer is likely higher because the disease can be hereditary. She is still working and pursuing her passion of helping others. Once a stay-at-home mother of three, Kantor returned to college as a medical student in her mid-30s. 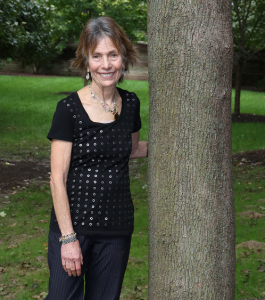 Having completed a biology degree at Bryn Mawr College in 1963, she took no refresher courses, and instead prepped for the MCAT by poring over the New York Times’ medical coverage and utilizing her public library. After she received her medical degree and completed her residency in psychiatry at The University of Medicine and Dentistry of New Jersey, Kantor spent decades working in private practice. During medical school, Kantor and her husband divorced, and she came to rely on loving au pairs and nannies. One of her nannies—a woman who became like family to the Kantors—earned a master’s degree in public health and became an administrator for a health agency. Several years ago, she offered Ruth an opportunity to counsel her HIV-positive, low-income patients in Newark. This has become a meaningful part-time position that Kantor cherishes in her quasi-retirement. With her adult children grown and three grandchildren keeping her young, Kantor said she wants her legacy to be forward-looking. “I feel strongly about charity, and I want to be a good role model for my children so they see the importance of giving,” Kantor said. As Robert Kurman transitions toward retirement after nearly 30 years with Hopkins, he is working to ensure that a new generation of doctors and educators carries on his legacy of life-changing work.